The elements are interchangeable in each model size to meet filtering requirements of different environment where equipments may operate. See performance chart for ratings of each. Simplified construction with four basic components. 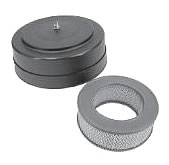 Three easily interchangeable filter elements. Nine standard MPT sizes from 3/4” to 4”. Directly mounted on air intake. Operation in temperature range: -65° to 250°F. No sealant required on pipe connection. Satisfactory sound attenuation on silencer models. Where filtration of dirt particles 10 micron or larger is required. The viscous impingement principle provides up to 94% arrestment efficiency on harmful dirt particles 10 micron and larger. 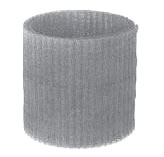 Crimped cylindrical shaped wire mesh element permits greater filter surface resulting in minimal pressure drop. The elements are reusable if cleaned properly and regularly. Where high efficiency filtration and long life at low pressure drop is required. Performance is better than 98% efficiency on particles of 3 micron mean diameter, over 99% efficiency on 5 micron mean particles, and virtually 100% efficiency on 10 micron particles and larger. The polyester media element comes with a wrap around prefilter providing extended service life. 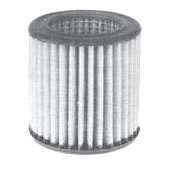 Where a high degree of filtration of extremely fine dirt particles is required. Standard laboratory tests indicate better than 99.3% efficiency using SAC fine dust test. The element can be cleaned by washing and reused. 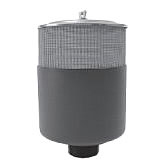 Where maximum dirt holding capacity and a high degree of filtration of extremely fine dirt particles is required; but where filter space is limited. Also for where low initial air flow restriction is desired. Low pro file design eliminated need to sacrifice filter capacity due to cramped installation envelope. Efficiency, initial pressure loss identical to DM Dry Paper Media. For better protection, elements with foam safety media are also available. Unimaze Small Filters are available in Filter-Silencer models. They include a silencing chamber which attenuates in the frequency range of 250 to 8000 hertz per second. An expansion chamber attenuates low frequency noise and an acoustical absorptive pad and baffles reduce high frequency sound emissions. 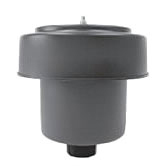 All Unimaze Small Filter and Filter-Silencer models can be supplied with attractive, lightweight durable plastic weatherhoods. Remove hood top and lift out element. Since element is oil wetted, they should be cleaned in any commercial cleaning solution such as Oakite and water. Dry thoroughly and immerse in SAE 30 engine oil. Drain off excess oil and reassemble. 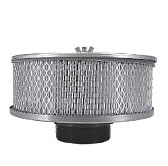 DO NOT CLEAN FILTER ELEMENT IN GASOLINE due to possible explosion on the receiver of a compressor. DA Filters must be cleaned at regular intervals. Filter elements should be replaced if ruptured or torn. When the outside surface of the element appears to be evenly coated with dirt, it should be cleaned as follows. Remove wing nut and lift off hood or top; remove wrap-around prefilter element and replace or clean by washing in water; lift out the main element; shake or blow off heavy dirt accumulations; if required, wash main element in cold or warm water (a mild detergent solution will assist in cleaning); rinse and allow element to dry; reassemble using new or cleaned wrap around prefilter element. 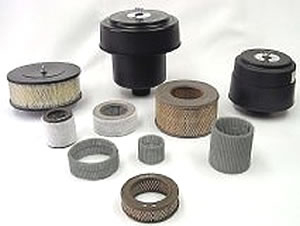 Dry Filters can be easily field serviced since accumulated dirt can be removed by tapping the element against the hand. Implant, clean by: (1) directing compressed air up and down the pleats on the element “clean” side (opposite the normal operating air flow direction) at nozzle pressure no greater than 30 psi; or (2) use garden hose to direct clean, warm water (70° to 100°F) up and down side of element at pressure no greater than 30 psi; or (3) wash in a mild detergent solution. Rinse and allow element to dry. Do not use other cleaning fluids. When washing fails to restore element, it should be replaced.